Wellington really turned on the charm today. It’s a truly beautiful city when the sun comes out and the wind dies down, with its huge harbour and the white and red houses perched on the sides of the steep, bushy hills. Petra showed me her climbing prowess today at Ferg’s gym on the waterfront. And we meandered around the waterfront which was a busy busy place today. We browsed the craft stalls enterprising businesses have set up as bait for the cruise ship tourists who flood the town at this time of year. Petra found herself a cute felt purse all the way from Tibet. We ate ice creams and I drank tea. We watched bold lads dive off the walkway into the sea and a couple of acrobats doing a performance. And most excellent of all, we saw a couple of huge sting rays flapping through the water under the piers. Right next to us and clearly visible in the sunlit water. But absolutely apart from us. They’re so stately and graceful, and so alien. 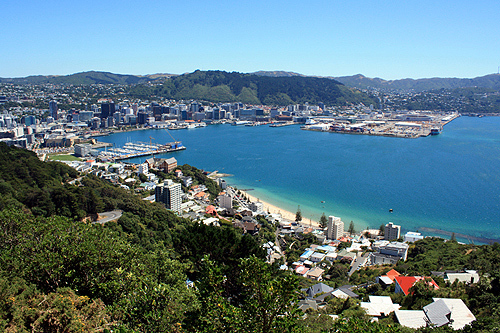 This entry was posted in New Zealand and tagged postaday2014, wellington, wellington harbour. Bookmark the permalink.